Can you make the robot even simpler? 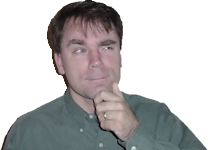 My motor needs a voltage above 6V, which is the limit for the logic chip. Can you make a back-and-forth robot that permits higher voltages? Yes! Let’s build a forward-reverse robot with a single motor and only a single 8-pin off-the-shelf chip! The robot is built on a 170 tie-point mini solderless breadboard (SparkFun PRT-08801), to make it that much easier for readers to reproduce themselves. 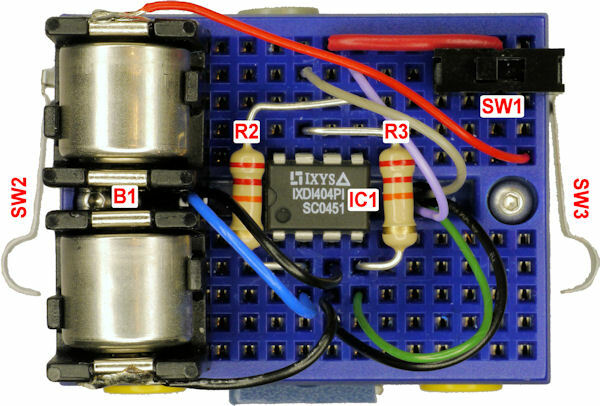 Back-And-Forth robot on a solderless breadboard. The heart of the robot is a Clare Semiconductor IXDI604PI dual inverting 4A MOSFET driver (IC1). (The IXYS IXDI404PI can be substituted if you have some lying around, like I did.) This chip is designed to drive MOSFET transistors, but I use the chip all over the place for driving light gearmotors. As you'll see on the schematic pages that follow, a pair of resistors (R2 & R3) feed the outputs of the motor driver chip back into the inputs, so that the chip can remember the current state. 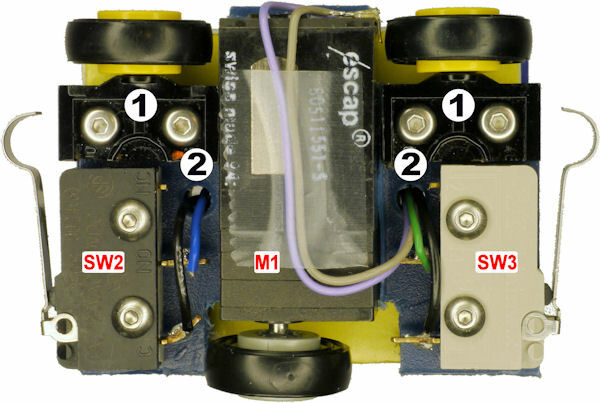 The robot has a snap-action switch on the back (SW2) and the front (SW3) to detect collisions with walls or other obstacles. However, the circuit will work with ordinary pushbuttons or even spring whiskers passing through loops of wire. Underside of robot with a single escap motor. Since the robot doesn’t spin or turn, only a single motor (M1) is required to provide motion. Additional wheels ① allow the robot to roll smoothly, but are not powered. A pair of 1/8-inch holes ② permits the wires to pass up the stack from the bottom to the breadboard. 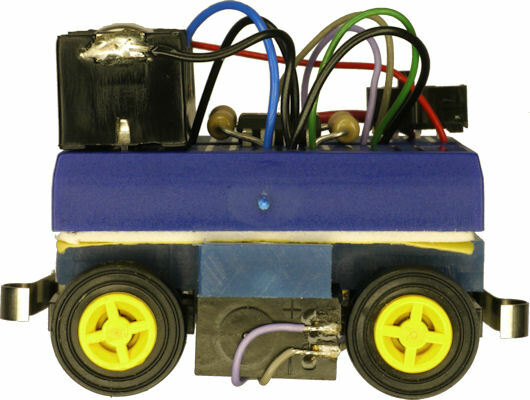 Side view of simple back and forth robot.